How to play Super Chef? How do I uncover and win prizes in Super Chef? What happens when I clear six of the same fruits or veggies in a row? Where is the timer in this game? 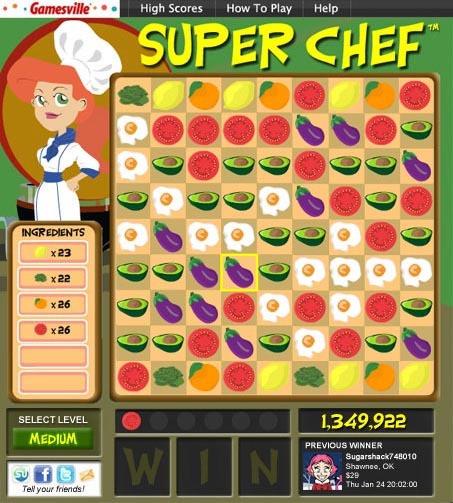 Super Chef is a free, single-player puzzle game with chat and GV Rewards! Find squares or rectangles of ingredients where the four corners are all the same type. ...to collect ingredients. The bigger the shapes, the bigger the points. Special orbs can act as "wild" ingredients, taking the place of any ingredient. Other orbs yield bonus points. When you see the letters W, I, or N on your board, make a square or rectangle with them inside or as one of the corner pieces. W, I, and N are wild and can match any ingredient. Light up W-I-N at the bottom of your game to win the GV Rewards Jackpot prize. Super Chef has both background music and sound effects. Use the slider to adjust the volume for both background music and sound effects. Click the music icon to turn off background music. When the music icon is white, background music is on. When the music icon is red, background music is off. Each level in Super Chef is composed of grid of ingredients and a list of ingredients you need to collect. To complete the level, you need to remove the required number of ingredients by making squares or rectangles where the four corners are all the same ingredients. To do this, click one corner of the rectangle, and then its opposite corner. This will make all of the ensnared ingredients disappear. Each time you remove ingredients, you gain points, and new ingredients will take the place of the departing ones. The round ends when you meet the requirements for the level, or you run out of moves. Sometimes, when you clear out items you reveal a letter tile: a W, an I, or an N.
When you see the letters W, I, or N on your board, make a square or rectangle with them inside or as one of the corner pieces. W, I, and N are wild and can match any ingredient. Light up W-I-N at the bottom of your game to win the GV Rewards Jackpot prize. Choose a letter (either W, I, or N) to reveal your prize. Your prize will GV Rewards ranging from 1,000 to 9,000GVs. Sometimes, when you clear out items you reveal a letter tile: a W, an I, or an N. When you see the letters W, I, or N on your board, make a square or rectangle with them inside or as one of the corner pieces. W, I, and N are wild and can match any ingredient. Light up W-I-N at the bottom of your game to win a cash prize. Choose a letter (either W, I, or N) to reveal your prize. When you collect a fruit or vegetable, the corresponding item will light up in the row below your game board. If you collect six consecutive groups of items that all have the same type of corner pieces, 150 bonus points are added to your score. But be careful: If you break your streak by collecting a group with a different set of corner pieces, the counter starts over again with the food item you most recently collected. Super Chef is meant to be played at your leisure, so there is no visible timer or clock. However, for those who enjoy moving quickly through levels, there is a time-related bonus: To receive the full 1,000 point time bonus, complete your level in under three minutes. You can still get a time bonus if it takes you longer than three minutes, but the time bonus is reduced a few points for every second over three minutes it takes you (until it reaches zero).